Cloud-based, Modular and Mobile-Ready! Compliant, Secure and Scalable! Access preferred suppliers through an online network of approved sourcing channels. Get the best prices through competitive bidding events such as e-Auction, eRFx, and e-bids. Eliminate the extreme bottleneck of invoice/purchase order processing and approvals slowed down by email lag-times and inefficient manual tasks. Configurable dashboard allows convenient access to the data you need; Dynamic report capability. Integrates with all internal, legacy and ERP systems. Leverage data, analytics and insights to know exactly what you spend. Strengthen and improve your position in future negotiations. Customizable report generation presents the information you want to see and how you want to see it — for cost-savings, projections and planning. Reduce your un-managed (tail) spend by eliminating non-compliant and uncompetitive contracts and vendors. Premium scorecards deliver real-time supplier performance to maintain compliance and help reduce risk. 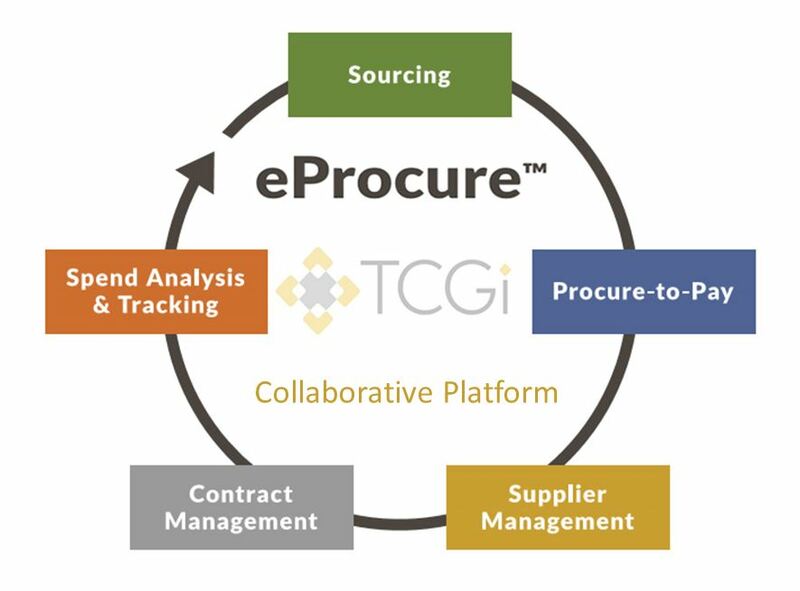 TCGi’s eProcure™ Collaborative Platform has all the essential components to automate and optimize your Procurement processes, resulting in significant cost reductions. 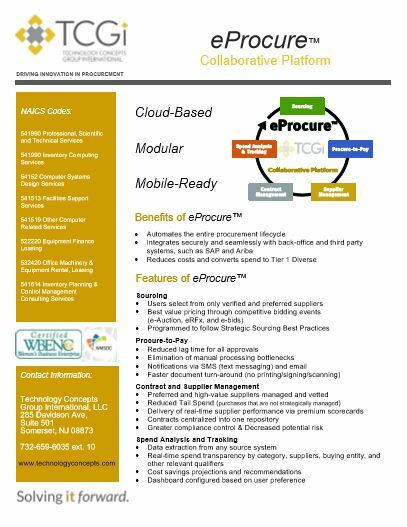 Contact us today to find out how we can make your Procurement organization more efficient.